You'll be £25.00 closer to your next £10.00 credit when you purchase Wandsworth and Battersea Battalions in the Great War. What's this? In 1915 Lord Kitchener extended his famous “Your Country Needs You” recruitment campaign by appealing to the Mayors of the London Metropolitan Boroughs, urging each Mayor to raise a unit of local men for active service overseas. In south-west London, the response from two neighbouring boroughs, Wandsworth and Battersea, could not have been more different. In Wandsworth, Mayor Dawnay personally took up the challenge and soon recruited, for the East Surrey Regiment, double the number of men needed for an infantry battalion. In Battersea, however, there was initially no more than lukewarm interest, partly due to the local Territorial Force unit, the 23rd London Regiment, having expanded from one to three battalions thanks to thousands of earlier volunteers. But as Wandsworth's efforts bore fruit, Battersea too pledged to raise a full infantry battalion. Mirroring the different political leanings of the two boroughs, Mayor Simmons pledged Battersea's battalion to the Queen's (Royal West Surrey) Regiment. Wandsworth's 13th East Surreys and Battersea's 10th Queen's both served with honour and distinction. But they, and the communities from which they came, also suffered thousands of men wounded and killed. This sacrifice cemented links with France, Belgium and Italy that continue today. From the early tragic death of an adventurous boy of just 15, to the heroic deeds of a dustman who won the Victoria Cross, this book describes the pain and the glory of the volunteers of Wandsworth and Battersea on the Western Front. Paul McCue lives in Surrey. A worthy addition to the series and a commended purchase for those with an interest in the parent regiments or boroughs. The year was 1914, the six month war, which was to be over by Christmas had suffered great casualties, a harrowing scar in a proud British barrier. It was evident to both the British army and the British public alike that this war was to last and grow and have a profound effect on the nations involved unless there was a brave, mass recruitment to fight for King and Country. 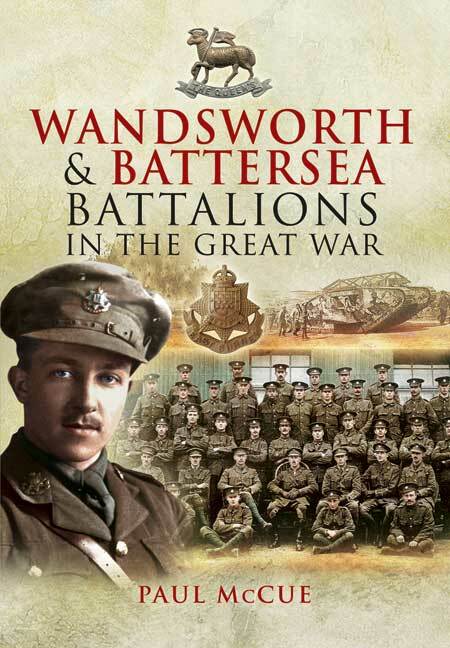 Paul McCue's book takes us on a journey of reason, of moral, of desperation which lead to the formation of two of the great British Battalions, Battersea and Wandsworth. No two battalions differed more greatly in initially recruitment quantities than these at opposed ends of London and McCue's thorough research delivers to us the driving force which spurred or failed to spur these volunteers on. Accompanied by original photographs and documents, we see the how pressures of poverty and the media's glorious portrayal of war enticed men to leave their loved ones behind and join the ranks, before being dragged through the shrapnel filled trenches to fight this cataclysmic war of the world. A fantastic yet woeful read and a honorable account of our true historical heros. In 1915 Lord Kitchener extended his famous “Your Country Needs You” recruitment campaign by appealing to the Mayors of the London Metropolitan Boroughs, urging each Mayor to raise a unit of local men for active service overseas. In south-west London, the response from two neighbouring boroughs, Wandsworth and Battersea, could not have been more different. In Wandsworth, Mayor Dawnay personally took up the challenge and soon recruited, for the East Surrey Regiment, double the number of men needed for an infantry battalion. In Battersea, however, there was initially no more than lukewarm interest, partly due to the local Territorial Force unit, the 23rd London Regiment, having expanded from one to three battalions thanks to thousands of earlier volunteers. But as Wandsworth’s efforts bore fruit, Battersea too pledged to raise a full infantry battalion. Mirroring the different political leanings of the two boroughs, Mayor Simmons pledged Battersea’s battalion to the Queen’s (Royal West Surrey) Regiment. Paul McCue starts each section with a detailed history of each area in question. This is important, but I would probably give a very bried overview of the early history, with more emphasis on the early twentieth century context of the borough. We then progress onto an interesting history of how each Battalion was formed – in both cases, by the Mayor and Council. There are interesting tales of how the Councils insisted on the Battalion’s being officered completely by local men, and of interesting recruitment drives and fundraising efforts to kit out the units. There are plenty of stories about individual men, particularly Corporal Edward ‘Tiny’ Foster, who won the Victoria Cross. At the end of the book McCue has included a full Roll of Honour for both Battalions, listed by Cemetery and Memorial. This is an excellent resource for researchers. The ‘Pals’ idea proved to be a dismal failure. If a Pals unit had a particulary tough battle, a whole towns menfolk could be lost in one fell swoop, and the impact on morale, both at home and on active service, was substantial. Whereas if men were dispersed around other units, losses would be more spread out. During the Second World War the Army did not make the same mistake, and dispersed men around Regiments much more. I applaud Pen and Sword for their Pals series. The Pals units are a uniquely local story – perhaps the most striking example in military history of towns and cities having a shared military heritage, forged through enlistment, training, battle and then losses and casualties. Producing histories of each of the Pals Battalions around the country provides not only something of local importance, but also a rich tapestry of the experience of war for ordinary local men and its impact on communities. It’s seriously got me thinking about the Portsmouth Pals, and what little we know about them.